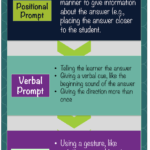 I have written in the past few posts about the IEP process and ways to prepare for it as well as writing goals and objectives, and determining mastery levels. 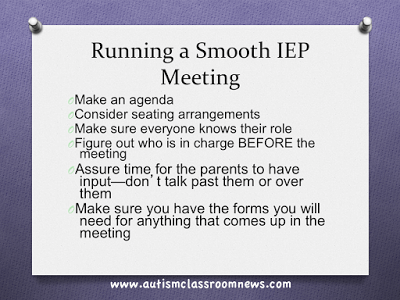 Today I want to talk about running an IEP meeting that is smooth and effective. We have all been in IEPs where everything was going great and the school and the family were on the same page. 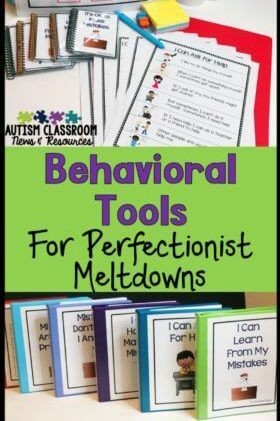 We have probably also (parents and educators) been in IEP meetings where things were not so great and people weren’t necessarily on the same page. 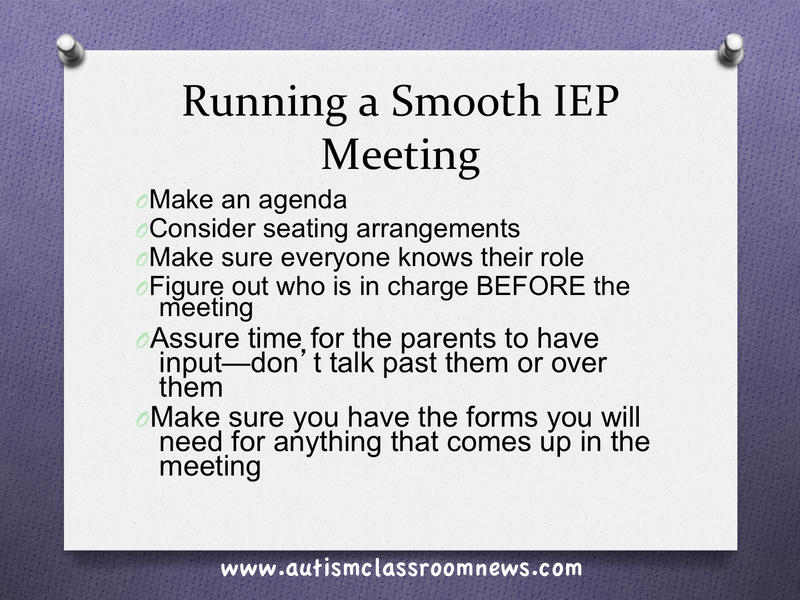 Regardless of what you are expecting in a meeting, these are tips I’ve used in a variety of situations to help IEP teams be prepared and help the meeting run smoothly. Getting through the IEP process is a stressful and often emotional process for families and educators alike. These are strategies that can help the whole team manage the meeting successfully. 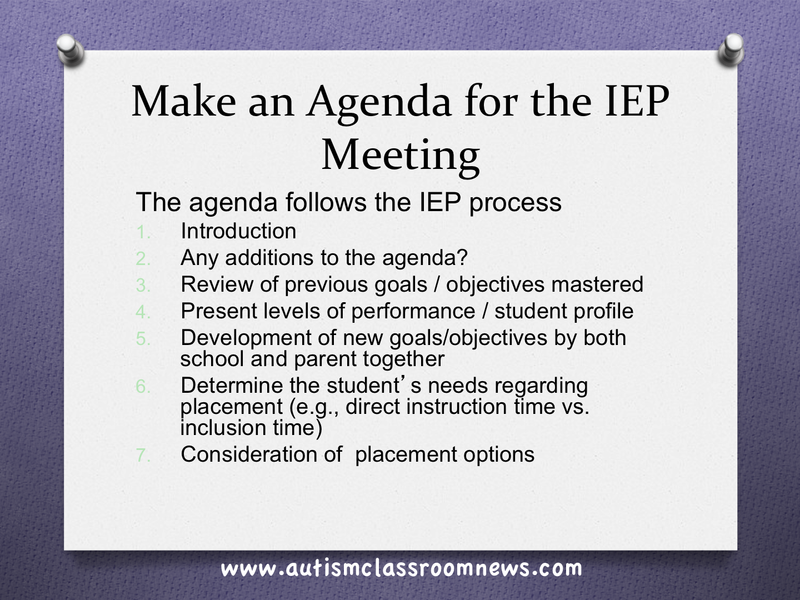 Many of us think that the IEP form itself is the agenda; however most IEP forms are set up for convenience of finding things, not the order in which the meeting is intended to proceed. 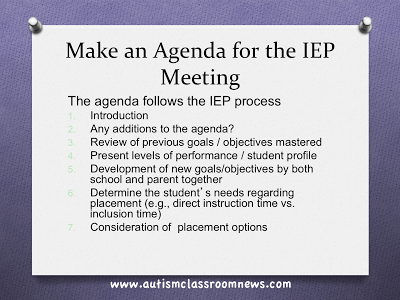 For instance, many IEP forms have the placement page on the front for easy reference–and yet placement is the last thing to be discussed in an IEP meeting. An agenda helps everyone remember what needs to be addressed and assures that things don’t get forgotten or left out. The advantages of an agenda are listed above. 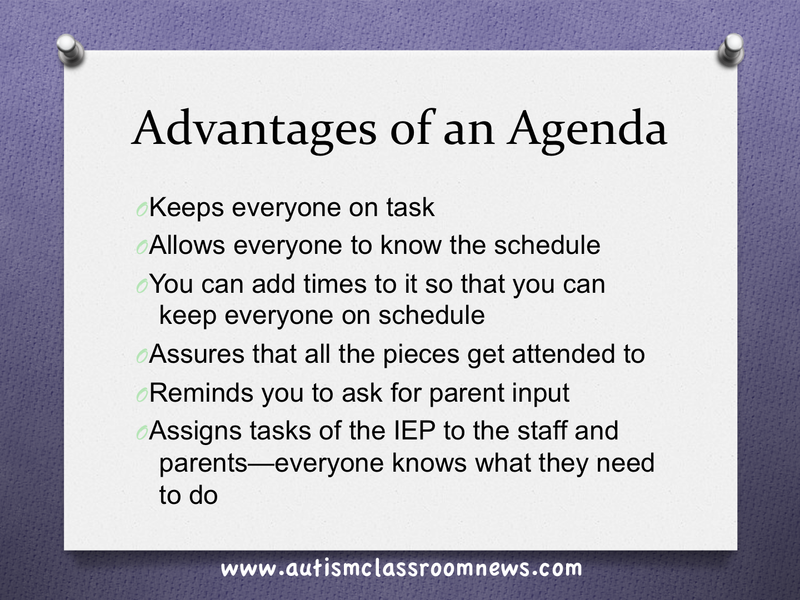 It’s important to remember that the agenda follows the IEP process, but it should also begin with the opportunity for any members (especially the parents) to add something that needs to be discussed to the agenda. Items for the agenda might be like the one below. Oftentimes we don’t think about where people are going to sit. Typically the school team is in the room first and sits where they feel comfortable. This may (or may not) result in families sitting on the opposite side of the table. An administrator I have worked with for several years and I always joke about making place cards for the IEP table because we have specific places we like to sit. We like the teacher to sit next to the family because the teacher typically is sharing paperwork that needs to be reviewed (or data) that parents need to be able to see and sometimes to sign. I like to sit across from the parents so I can look at them when I deliver what is sometimes evaluation information or consultation observations. The administrator likes to sit next to the teacher and to the side of the parents because she is not the focus of attention. Where you sit (and others sit) is important so think about what works for the group and try to avoid having it be our side of the table and theirs. On the other hand, try to allow families to sit together or with advocates or others they have brought with them. Separating a parent from someone who has come to provide support to them somewhat defeats the purpose and sends the wrong message. 3. Make sure everyone knows their role and who is in charge. 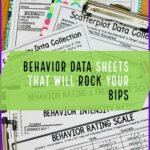 A while back I did a post where I wrote a social story for an IEP team because it’s important that everyone understands the perspective of the other participants. You can find that post here. It’s important to know who the LEA (Local Education Administrator) is because that is the person who is authorized to make decisions. Who is the person who can interpret evaluation material? The general education teacher serves a couple of purposes and we really need to do a good job of helping them understand the process and their role in it. The gen. ed. 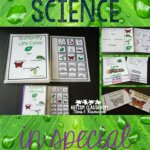 teacher provides valuable information about what a typical student of the child’s age is doing in the curriculum, what his or her classroom looks like, and what types of activities her students are doing. She also, if she knows the child, can talk about the strengths and weaknesses he or she sees in the student and the types of supports that the student might need in the general education classroom. I strongly believe that we should try to have general educators in the meeting for the length of the meeting rather than let them speak and then leave, unless the meeting is unusually long. We need to recognize they are an integral part of the process and not an add-on, even for children who are primarily self-contained. The IEP process is old hat to many of us who have been doing it for a while. To a family, even one whose child has been in special education for a long time, it is emotional and often overwhelming. It’s easy for us, as the educators, to get caught up about the process and forget about its function. Slow down and watch the family. Do they seem like they clearly understand what is being said? If not, stop and see if they have questions. Give them an opportunity to take a break. We throw a lot of information (and paper) at them during a meeting and asking them to process it all immediately is difficult. Sending drafts home before hand can help this, but it’s important to give them an opportunity to talk about goals and objectives that are proposed, discuss services and what they will look like for their child, and ask questions that occur to them–even if they were about something we talked about 15 minutes ago. Assign someone the role in the meeting of watching the parents and slowing the process down if they seem to be missing something or getting overwhelmed. Nothing stops a meeting faster than having someone have to worry about the form. Don’t get hung up on the form and ignore the people, but also if you have all the forms in a notebook available, you can pull them out and move forward with the meeting when you need an evaluation consent, or parent rights, or others that might stop the process and leave empty time that no one can afford. 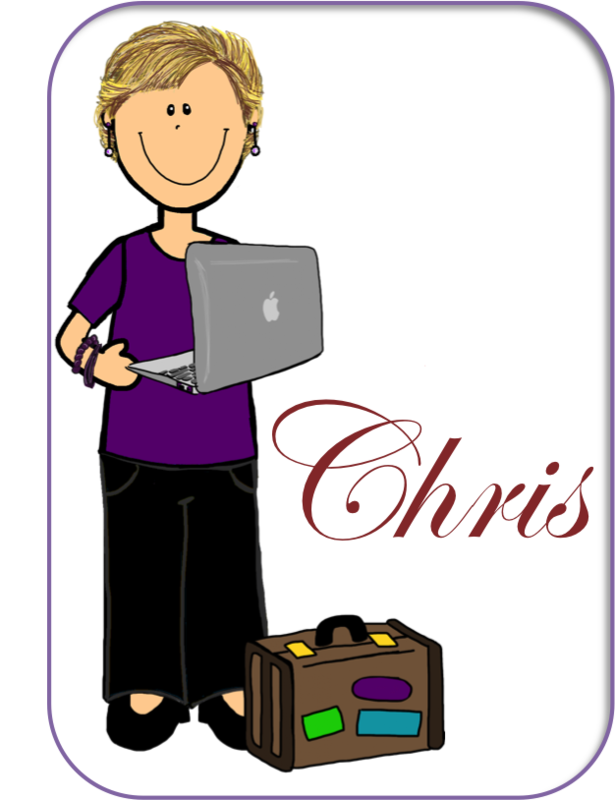 Think about having an IEP notebook that has all the forms in it. Or, in the electronic age, make sure you have access to a printer and can get to the online program from the room you are in to make sure this is efficient. Consider having a printout of the IEP for the family, at least. Most of the school team members had the option to print one out but the parents often didn’t. Although we are trying to go paperless in many schools, the projector with the tiny print from the IEP program is difficult to read and can slow the process down. If we can make the process more efficient with a paper copy, I would say it’s worth it. So, I will be back in the next post to continue to talk about ways to help the process go smoothly once the meeting has begun. In the meantime, what suggestions do you have for helping the IEP process be a positive one for all involved?